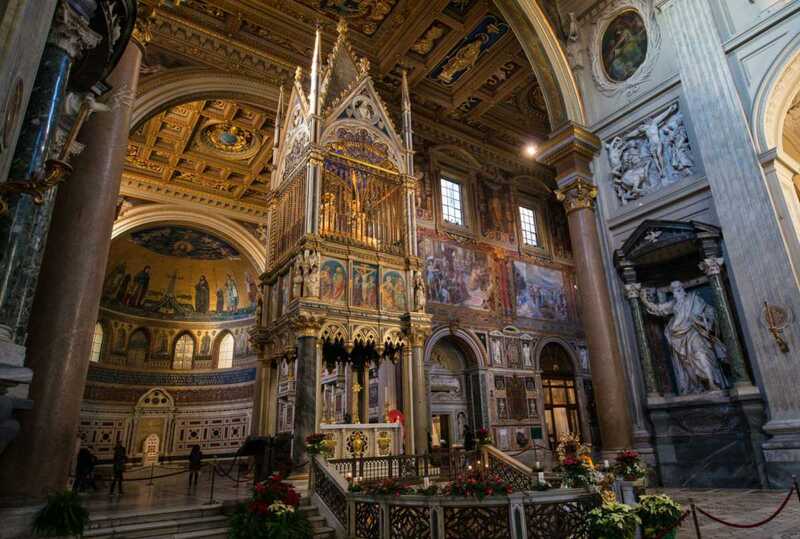 The pope’s chair, or cathedra, is at Saint John Lateran in Rome. It’s not at Saint Peter’s. 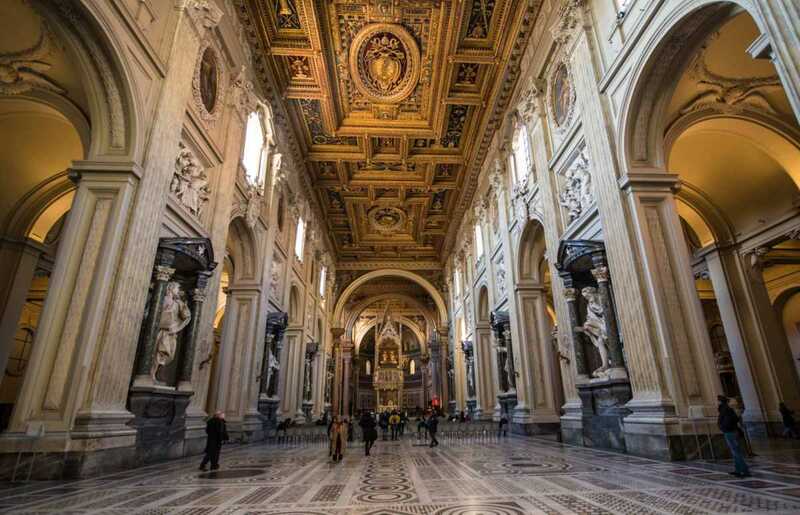 If you said that St. Peter’s Basilica is the Pope’s “home church” in Rome, you’d be wrong. In fact, the Pope’s chair (cathedra in Latin, hence the English word cathedral) is at St. John Lateran Church, outside of Vatican City. The original church was built in the 4th Century, just after Emperor Constantine legitimized the Christian Church in the Roman Empire. St. John Lateran is actually the oldest church in the Western Roman Empire. But over the years, and because of a couple of fires and an earthquake, the church was entirely rebuilt, and today is an enormous mostly 18th Century Baroque masterpiece, which you can see a bit of here. And, it’s a fitting setting for the papal throne. The half dome of the apse, over the papal chair, maintains an earlier style, derived from the Byzantine, called Cosmatesque, after the Cosmati family, the Italian masters of mosaic. 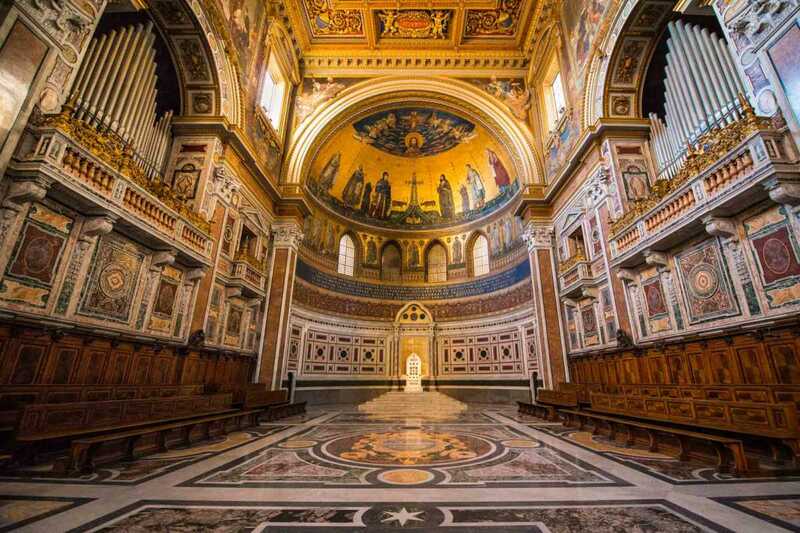 So in the shot, you see the mosaic half dome and the inlaid decoration of the Pope’s throne and platform, flanked by the two organs set into their more “modern” decorative style walls. Three of the Apostles lining the nave. That’s St. James the Lesser on the right. 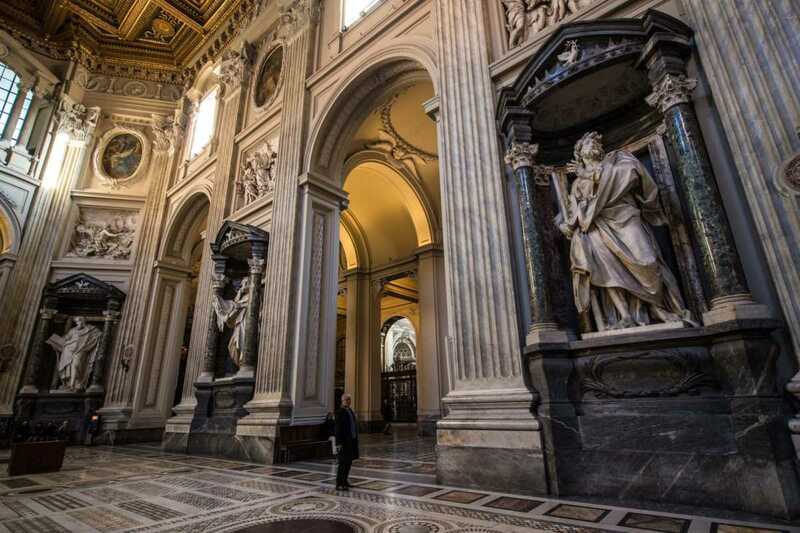 The Archbasilica of Saint John Lateran is notable for a few reasons. First, it’s the oldest church in Rome. Second, as I mentioned above, it is the actual seat of the Pope, his “home” church. And third, while it’s outside the boundaries of Vatican City, it is the property of the Vatican and so enjoys “extraterritorial” status, much like an embassy in a foreign country. The church actually dates from the time of Constantine, the first Christian Roman emperor, who donated the site to the pope in 313. It’s on the original site of the oldest church in Rome. The term Lateran, by the way, comes from the Lateranus family of ancient Rome. Constantine confiscated their properties in the city and gave them to the nascent Church. The church of St. John Lateran has been rebuilt many times. The current version was built in the early 18th Century and exhibits the style of the time: neo classical, with at nod to the Baroque and an homage or two to the Romanesque. All in all, slightly confusing, but the scale and execution make for a spectacular presentation. 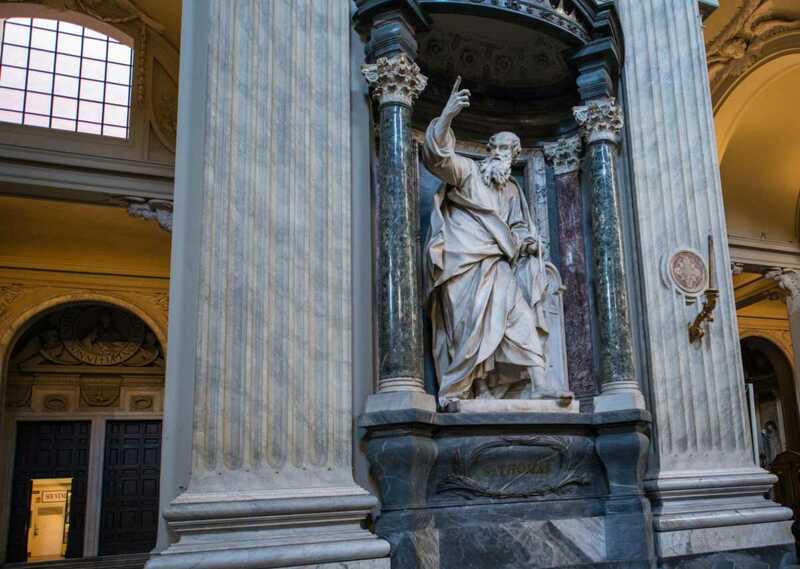 I particularly like the mosaic dome above the Baldacchino, the marble surrounds of the Cathedra, or seat of the pope, and the statues of the Apostles (plus Saint Paul) that line the nave. The patterned marble floor is pretty cool, too. The parts add up to a beautiful whole. By the way, I encourage you to read the comments below for an interesting and enlightening discussion of the terms cathedra, seat, and chair. The Baldacchino, and behind it, the mosaic dome. The nave of St. John Lateran, with its guardian saints, looking at the Baldacchino. St. Jude, aka Thaddeus. The patron saint of lost causes. St. Thomas. I had to include him, no? Saint John Lateran is one of the “extraterritorial” properties of the Vatican in Rome that are part of a designated UNESCO World Heritage site in Italy. 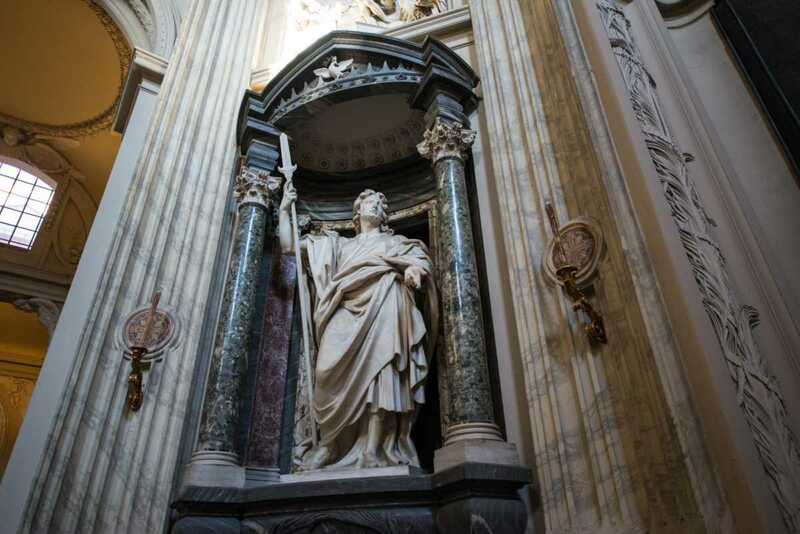 Saint John Lateran is also one of my 28 Things to See and Do in Rome. And, if you’re attracted to later Roman church decoration, there’s a baroque masterpiece or two you can also have a look at. I’ve recently updated my photo equipment page to account for a lot of recent purchases to enhance my kit, So please click here for more information. You can buy prints of my photos–or just look at past photos–on my Travel Photos page. If you’re looking for tours in Rome, and it’s often a very good idea to take a tour because 1) you can often skip the lines, and 2) you might learn something. If you take one of the tours you find below, Travel Past 50 will earn a small commission at no extra cost to you. Beautiful photo, Tom (often the case). Well, since we’re going all Word Fascist, the Latin word is actually sedes, not sede, unless you’re talking about the ablative case, in which case the translation would probably be something like “on the seat.” (Sede is good Spanish, though.) But, you’re right about cathedra’s first meaning being “chair” and I was perhaps being a little cavalier in my equation of seat and chair, although when you’re talking about something you sit on, there is probably little distinction in English. That said, I think though, that an official place were someone sits is usually called a seat, e.g. a seat in Congress. Strangely, the etymology of English chair is from Greek καθέδρα, which is the same word in Latin, cathedra. Seat, though, according to my quick research, doesn’t come from sedes, but from an old Norse word sit, which means to sit. It all comes from Proto-Indo European though. That sort of got out of hand, didn’t it? I got it right in the headline, at least. And, while I’m on my pedantic rant, when the Pope speaks “infallibly” he speaks “ex cathedra,” i.e. from the chair. Indeed. If memory serves (i.e. refraining from the Google machine), the last ex-cathedra was in 1950 and the Pope has to physcially sit on that nice shiny chair you have in the photo in order to make it official. I’m going to dinner now. Anyone else reading this thread is restricted to commenting on the beauty of the church. Or what their favorite color is. My favorite color is green. Ha! I love the photo…whatever it’s called! Actually, Corinne, I was thinking it should be called a pew. My favorite color is green, too. You have good taste. I’m coming late to this discussion. My favorite color is green, too! Mine, too. Although I’m also partial to red. Hic est papalis sedes et pontificalis (“This is a papal and pontifical seat”). Thanks for this, Bruce. This helps clear up the “seat” question.